Further muddying the role and powers of local councils is the rise of militias across government-held Syria.9.“All the President’s Militias: Assad’s Militiafication of Syria” : Middle East Institute10.“Myths, Militias, and the future of Syria” : Aymenn Jawad al-Tamimi This is particularly prevalent in the governorates of Suwayda11.https://twitter.com/vincebeshara/status/896166426095927296 and Hama12.https://twitter.com/delfoo/status/940209628020867074 and in the city of Aleppo. The complex relationship between militias, local councils, reconciled cities, and central authorities is not unlike the experiences of opposition local councils. However, this tangled tapestry is far too complex to cover in its entirety in one article. Therefore, this piece will focus on the relationships between local councils, the central government, and non-governmental organisations (NGO) in the ‘heart’ of loyalist Syria: the governorates of Hama, Latakia, and Tartous. Though opposition local councils experience little to no oversight from the Syrian Opposition Council, baladiya and city councils ultimately answer to the regional and central governments.13.Khalaf, Rana. “Governance without Government in Syria: Civil Society and State Building during Conflict” This federal oversight often runs one way; while Prime Minister Khamis and regional governors are quick to remove a council under the dubious charge of “corruption,” financial and logistical support for local infrastructure is regularly ignored by central authorities. There are near daily complaints on community Facebook pages of decrepit infrastructure and non-existent social services across government-held Syria, with blame directed at both local leaders and governors. While local councils are responsible for providing social services, these actions require federal funds. A November 2017 post depicting a trash-filled field in Talaat Rekhtin. 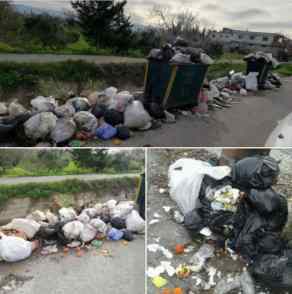 In January 2018 the Jableh community of Ayn Shiqaq complained of more than a month of trash buildup, stating that the “municipality is only interested in the main street while farms and secondary streets lack cleanliness.” Whether the municipality is ignoring its rural areas due to corruption or simply lack of capability in not clear. Yet even in a major coastal city like Latakia, waste services appear to have ceased long ago. 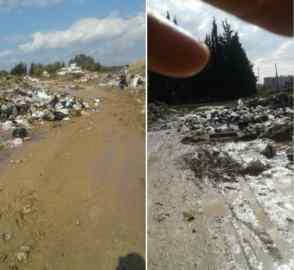 Another January 2018 post laments the piles of trash in the city’s Naqa’a neighbourhood, again asking the municipality to address the health hazard. A January 2018 post from Ayn Shiqaq depicting over a month’s worth of trash buildup. 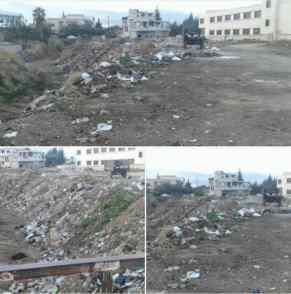 A January 2018 post from the city of Latakia showing piles of trash in the Naqa’a neighbourhood. Perhaps more serious is the crumbling sewage and road systems in the heart of loyalist Syria. From rural Homs to the Alawite strongholds along the coast, raw sewage threatens civilians with disease and contaminates water supplies. 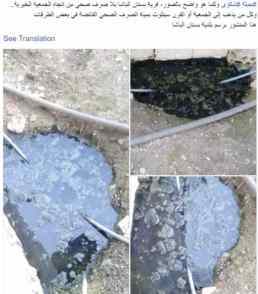 An October 2017 post from al-Ragama, Homs warns of the spread of diseases after its sewage system began leaking into the town’s wells and the regional government did not pump in any clean water. Residents commenting on the post further claim that the region had been enduring a Hepatitis A outbreak for more than five months, while another town northwest of al-Ragama had no new water projects and no working phone network. An October 2017 post on a pro-government Homs page about water contamination in Ragama. Two users comment on further issues in the region. A November 2017 post by the Jaramana News Network depicting ongoing sewage issue in the town. In the coastal town of Bustan Basha, raw sewage separates residents from their homes and the local charity association building. A July 2017 community post warns residents of the health risks in walking to the charity and requests that the municipality resolve the issue. 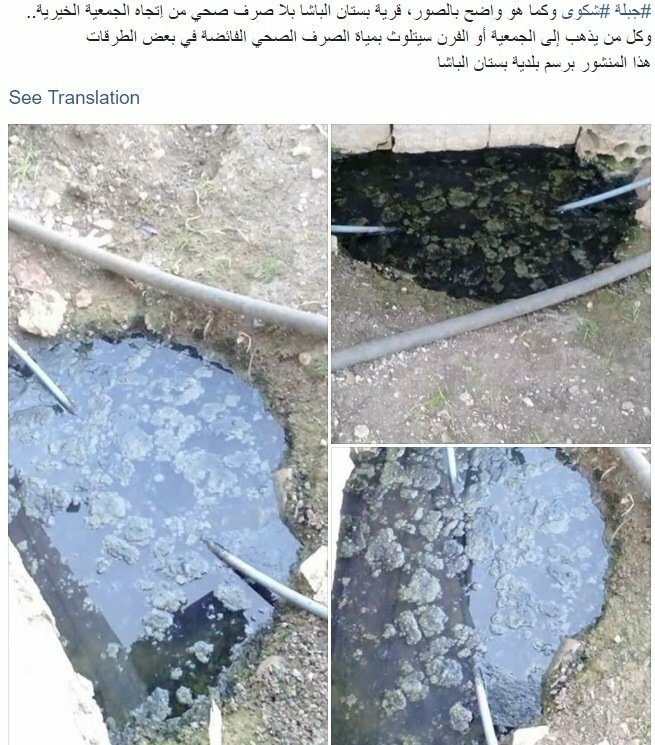 A July 2017 post on a pro-government FB page depicting overflowing sewage in Bustan Basha. Raw sewage and crumbling infrastructure may seem a mundane issue in a country ravaged by seven years of war, but these issues can prove deadly. On February 4, 2018, a local fighter from Suwayda died of his injuries after falling into a septic tank. A common complaint among Syrians is the risk that open sewage and damaged roads pose to their children as they walk to and from school. 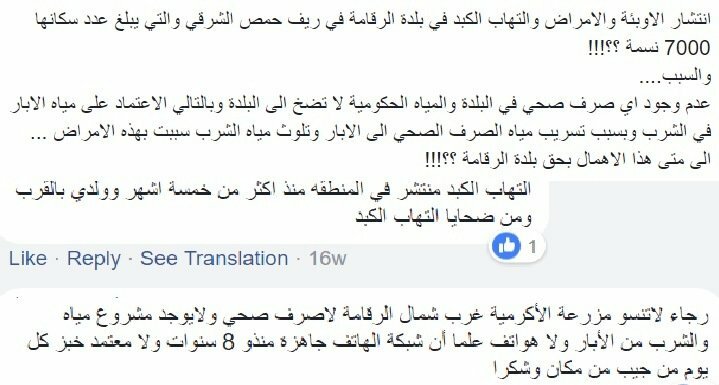 A February 2018 post on a pro-government FB page about a soldier who died falling into an open septic tank in Suwayda. As the case of al-Ragama shows, poorly maintained sewage lines will eventually contaminate drinking water. Interestingly, nearly all of the community posts complaining of trash and sewage issues address the municipality while also blaming regional governors or central government figures. Yet as with opposition local councils, these municipalities are not capable of fixing every problem on their own. Government-controlled local councils require material and human support and funding from the federal government, yet it appears that they rarely receive it. Despite the obvious lack of support for local councils from regional governments and Damascus, Assad’s hand-picked ministers and governors still hold ultimate power over local officials.14.“Syria’s Decentralisation Roadmap” : Carnegie Endowment From March to July 2017, at least nine local councils in Hama, Latakia, and Tartous were disbanded or saw their heads fired under the pretence of corruption. 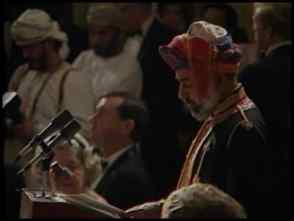 The main culprits, according to local news, were Assad and Prime Minister Khamis. Then, on July 17, four more councils were dissolved. The city council of Masyaf, Hama was dissolved by a presidential decree “based on the provisions of the Local Administration Law, Decree 107.”17.Syrian Office of the Prime Minister In the governorate of Tartous, the Hamin city council and the municipal councils of Ayn Zarqa and Maten Sahel were dissolved due to “failure to implement work plans.”18. Local councils do not always receive the assistance they need, however. As the security situation in Jableh, Latakia continued to deteriorate this winter, the city council turned to the Minister of the Interior to help restore order. Yet despite the residents’ horrific stories of unsolved crimes such as a dismembered body, a young man killed in front of his house, and a baby found dead in an alley, the Minister reportedly refused to help. 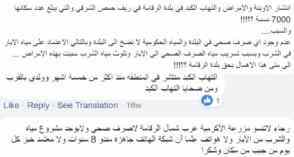 A January 2018 FB post describing brutal murders in Jableh, Latakia, and the Ministry of Interior’s refusal to help. As Damascus’ ability to provide basic services for Syrians rapidly collapsed, local councils increasingly sought the help of outsiders. As with opposition-run local councils, baladiya and city councils have increasingly relied on the United Nations, NGOs, and foreign sponsors in order to provide basic needs to their citizens. 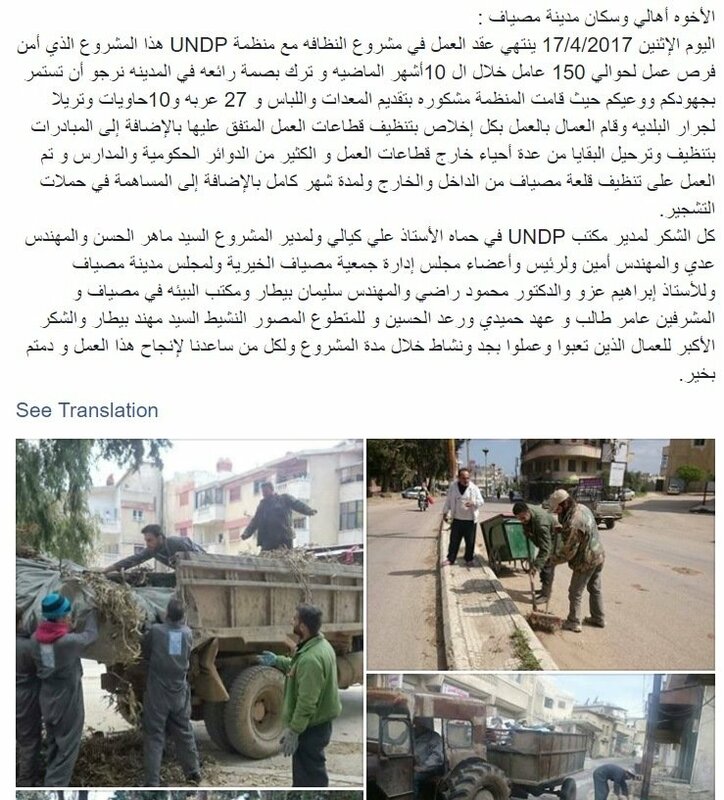 In one example, a ten month UNDP project provided 27 vehicles, 10 garbage containers, and tractors to the city of Masyaf for city repairs and trash cleanup. The “employment contract” ran from June 2016 to April 2017 and employed 150 locals. The project was coordinated between the UNDP director in Hama, the Board of Directors of Masyaf Charity Association, the City Council of Masyaf, and the Environment Office in Masyaf. Notably absent is any mention of the central government, indicating that local councils wield the authority to deal directly with charities and NGOs to provide basic services. Post summarising the UNDP cleanup program in Masyaf, Hama, run in conjunction with the local council. 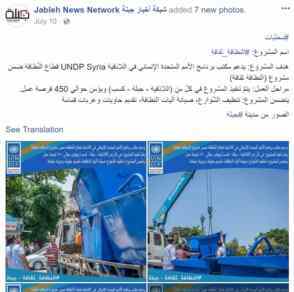 In July 2017, the UNDP launched a sanitation program in the coastal cities of Latakia, Jableh, and Kasseb. The program employs an estimated 450 locals and provides street cleaning, waste bins, and garbage trucks for the cities. Local FB page announces the start of a UNDP sanitation program in Latakia, Jableh, and Kasseb. Members of the French far-right Christian NGO SOS Chrétiens d’Orient pose with NDF fighters from Mahradah. The Christian enclaves north of Hama also present a unique example of government-controlled communities seeking additional support from a foreign country to fill budgetary and administrative gaps. As profiled by Stanimir Dobrev, Suqaylabiyah and Mahradah, the two largest Christian cities in Syria, have built deep ties with Russia since at least 2016.31.https://twitter.com/delfoo/status/940209628020867074 The financial and political capital leveraged through this connection and the crucial role the towns play along a major front-line has propelled their militias from low-tier NDF battalions to powerful fighting units. Dobrev has tracked a steady rise in prestigious meetings with Russian officers and awards ceremonies for local commanders. Central to this relationship appears to be the shared religion, as evidenced by the prominent display of religious symbols during meetings and the numerous Russian Orthodox combat priests present in the towns. 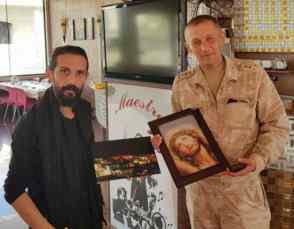 NDF commander in Suqaylabiyah, Nabel Abdulah, meets with a Russian army captain holding a picture of Jesus Christ. United Nations aid organisations and similar NGOs have essentially prevented the total collapse of basic state functions in Syria. While Damascus continues to exert arbitrary control over local councils, its legitimacy as a governing body has been weakened by its inability to provide for Syrian loyalists. Pro-government Syrians may not openly direct anger towards the al-Assad family, but Facebook posts and comments reveal widespread disdain for regional and central authorities. The experience of Masyaf residents under the interim local council further casts doubts on Damascus’ ability to effectively utilise the local council model: centrally appointed local leadership appears to run afoul of Syrians’ desires for elected officials. Even towns that hold prominent roles in the defence of the Assad government have neither escaped Damascus’ wrath nor benefited from their positions of prestige. Masyaf, the economic and social heart of the now-famous Air Intelligence-affiliated Tiger Forces, hosted both Governor Hazouri and Prime Minister Khamis as they discussed new development projects just two months before its local council was removed by presidential decree.32.“مجلس مدينة مصياف يطالب بإعادة تأهيل المخطط التنظيمي وإقامة مشاريع تنموية” : SANA As profiled here and above, the crucial coastal governorates of Latakia and Tartous suffer from crumbling infrastructure and low funding. Complaints about these issues, even if directed towards the appropriate ministries, have gone mostly unheeded. As the Syrian government recaptures more towns and cities from opposition groups, it must reconcile with the fact that most Syrians have lived the past years under limited self-governance. Assad’s staunch ally, Russia, accepted this reality in January 2017 when it incorporated local administrations into its draft Syrian constitution. Now Assad must decide if he will allow local councils to flourish, or remain under the heel of Damascus. A previous version of this article incorrectly stated that only 13% of local councils exist under government control. This has been updated to 56% thanks to new information provided by Ayman Al-Das, a local councils research at Omran Center for Strategic Studies. Gregory Waters is a graduate student at the University of California, Berkeley and a fellow at the UC Berkeley Human Rights Investigations Lab. He researches conflicts and political transitions in the MENA region, primarily using open source information. His current research focuses on mapping Syrian militia unit structures. He publishes his research here and on Twitter. 5, 6, 7. ↑ Aymenn J. al-Tamimi, Interviewed by author, 4 March 2018, email interview.